In order to supply you with the healthiest plants possible we grow our forestry trees two different sized tubes, 50mm and 90mm mega tubes. These tubes have 'root trainers' - an open bottom design of the tube, that promotes air pruning of roots. This results in an increased number of young root tips that leads to a strong straight root system in contrast to a curled or root bound system. All trees are graded and spaced in mesh trays so that trees don't require staking when being planted out. There is some variation in both the price and the size of tubestock plants. 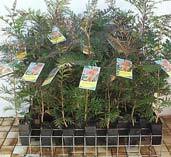 Prices begin at $1.95 however they can be priced up to $12.95 depending on the availability of seed, the degree of difficulty in growing and the pot size Some plants are grown from seed whilst others such as the grevilleas and aniseed myrtle are grown from cuttings. The average size of most trees is 30-60cm however this can vary significantly with fast growing sturdy eucalypts reaching up to 45cm and smaller species such as the Native Violet reaching only about 10cm. During our trials seedlings planted out have obtained up to 3 metres growth in 12 months. Growth rates are dependent on many factors including species selection, however with a good quality slow release fertiliser, soil preparation and mulching our results are consistent.